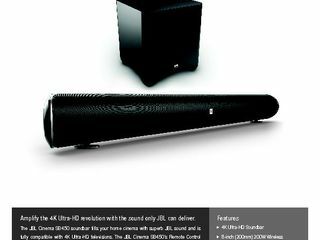 IFA 2016, BERLIN – HARMAN International Industries, Incorporated (NYSE:HAR), the premier connected technologies company for automotive, consumer and enterprise markets, today unveiled JBL Cinema SB450, a 2.1 soundbar with a wireless subwoofer designed to complement the latest 4K ultra-High-Definition (HD) video devices. 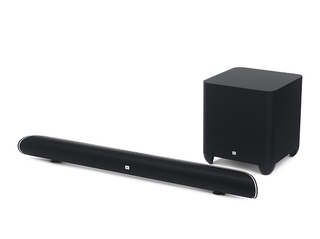 JBL’s newest soundbar works seamlessly with 4K displays and features extraordinary JBL audio performance. The JBL Cinema SB450 fills any room with theatre-quality sound and music using HARMAN Display Surround sound and Dolby Digital decoding. Whether binge-watching the latest must-see shows or cheering along to live sports, the JBL Cinema SB450 provides powerful bass with its wireless 8-inch 200W wireless subwoofer. Movie lovers can enjoy clean dialogue and voice enhancements for crisp, clear sound during films without having to adjust volume. 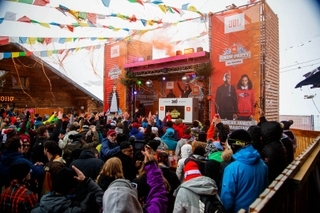 Further, JBL enthusiasts can amplify their listening experience with JBL Connect: users can stream Bluetooth audio to the SB450 and other JBL Connect-enabled speakers at the same time by connecting JBL Connect-enabled speakers to their SB450. Multiple devices can connect to the soundbar through three HDMI inputs, while one HDMI output (ARC) seamlessly connects to the TV. When also connected to Bluetooth-enabled devices, movie and music lovers can automatically switch between television audio and a phone or tablet audio using JBL SoundShift™. The JBL Cinema SB450 is sleek, simple, and easy to use. Its understated look and feel allows for the soundbar and subwoofer to tastefully blend into any existing home theatre. With the TV remote control learning feature, users are able to program the soundbar to accept signals from their existing TV remote, eliminating the need for multiple controllers. The JBL Cinema SB450 is available at JBL.com and select retailers for €599,- from October 2016.